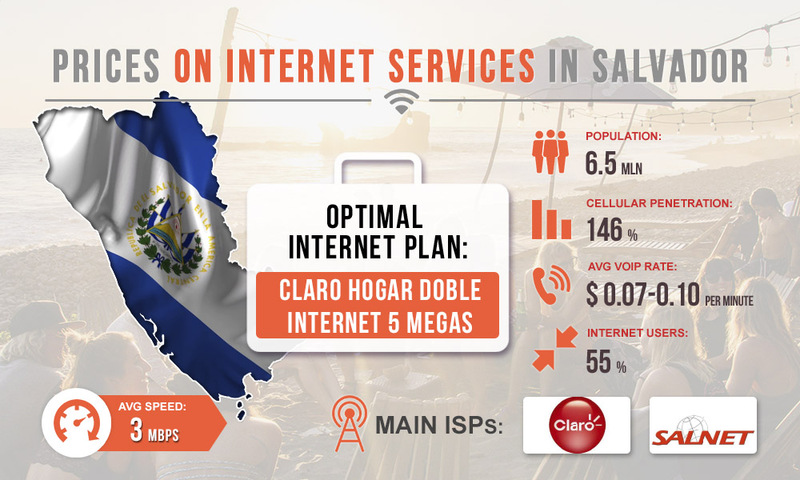 The telecommunications market in the Republic of El Salvador is quite well-developed to-date, despite poor infrastructure. The broadband Internet sector is limited by the reduction in the number of fixed lines. However, there is still a possibility of connecting a stable Internet with excellent speed. What we have to do now is to find out how much the Internet in El Salvador will cost for profitable GSM termination. Claro Hogar Doble Internet 5 Megas. Data download speed - 5 Mbps. Price - $25 a month. Claro Hogar Doble Internet 10 Megas. Data download speed - 10 Mbps. Price - $40 a month. Claro Hogar Doble Internet 30 Megas. Data download speed - 30 Mbps. Price - $65 a month. For earnings on VoIP termination, it is better to give preference to the Internet plan Claro Hogar Doble Internet 5 Megas. For normal operation of the n2 gsm gateway without interruptions in one location, a speed of 5 Mbps is sufficient (for each gateway channel it is necessary to provide a speed of about 42 Kbps). Moreover, you can save on paying for Internet services, because the cost of this Internet package is only $25 (you need to pay a monthly fee). With minimum earnings of $ 100 from each port of VoIP equipment, this would be well-justified expenses for connecting the Internet. Remember that it is better to place several pieces of equipment in different locations rather than have all the gateways in one place.